You wake up alone after an emergency caesarean, desperate to see your child. And when you are shown the small infant in the nursery, a terrible thought takes root: this baby is not your baby. No one believes you. Not the nurses, your father or even your own husband. They say you’re confused and delusional. Dangerous. But you’re a doctor – you know how easily mistakes can be made. It’s up to you to find your real child, your miracle baby, before it’s too late. With everyone against you, is it safe to trust your instincts? Or are memories from your past clouding your judgement? This can’t all be in your head . . . can it? ‘Someone’s stolen your baby. But no one believes you.’ Susi Fox’s debut novel is blessed with the kind of hook that publishers and booksellers must dream of. With such a great premise, who wouldn’t read this book? 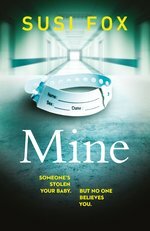 But Mine is more than just a suspense novel about a mother’s worst nightmare. It’s also a thoughtful and nuanced examination of the many ways women’s expectations around childbirth and motherhood can be crushed. Before she even arrives at hospital, Sasha’s journey to becoming a mum has been a challenging one. The spectre of a terrible mistake made years before as a trainee doctor still looms large and continues to impact her mental health. So too does the absence of her mother, missing without adequate explanation for most of Sasha’s life. But things get even worse when she wakes up in a small local hospital after having an emergency caesarean to deliver her baby at just 35 weeks. As a doctor, Sasha thinks of herself as an insider, someone who’ll be able to take control of her situation despite the setback. Unfortunately, she’s very mistaken. Her status as a doctor carries little weight and she bristles at finding herself as the observed and not the observer. Sasha is presented with the sight of her premature son in a humidicrib: ‘I stare at him as I would any other premature newborn. I don’t feel like his mother at all.’ So begins Sasha’s struggle, as the terrible idea takes hold that this might not really be her baby at all. Sasha is already having her doubts about the run-down regional hospital with a slightly dodgy reputation. She claims to be able to spot incompetence ‘like a watermark’ and sadly, from her own experience, she knows exactly how easy mistakes can be made. But is this a case of a mix-up of newborns in an understaffed hospital? Or are the ghosts of her own troubled past getting in the way of the maternal connection she’s so desperate to feel? Although the book is narrated primarily from Sasha’s first-person point of view, Fox includes just the right amount of additional perspective to raise readers’ suspicions as to her reliability. Fox’s ability to play with our doubt in this way builds suspense and takes the story to all kinds of interesting places. By undermining her readers’ confidence in her main protagonist like this, Susi Fox makes a devastating point about how the concerns of mothers can be so easily dismissed by the medical profession. Sasha is gripped by her conviction that her real baby is somewhere else in the hospital. But when her insistent behaviour begins to be viewed in the context of mental illness then we, as readers, also become complicit. With nurses, doctors and even her own husband lined up against her, Sasha is forced to summon superhuman levels of strength and resourcefulness to get the answers she needs. Susi Fox works as a doctor and her observations of the daily rhythms on a hospital’s neo-natal ward are particularly good to read. Her writing about motherhood is both tender and unflinchingly honest. Aside from the extreme situation Sasha finds herself in, there’s something inherently terrifying about having a baby and a novel like Mine plays beautifully on these fears. Fox does a good job exploring the loss of control, isolation and anxiety faced by new mothers, especially when it seems as though everyone is judging them. Having a baby is a uniquely personal experience, but it’s also unavoidably public. But what if the people supposed to be caring for you and your tiny baby can’t be trusted? Even worse, what if everyone says you’re the one who shouldn’t be trusted? In this way, Mine takes two very believable scenarios and smashes them together. The first scenario, while rare, is that newborns can easily be switched either inadvertently or maliciously. The second scenario, far more common, is that postnatal mental illness is serious and real and demands swift medical intervention. There’s a lot about Mine to admire. Sasha is a prickly and complex character, but she’s tenacious. Ultimately, she pays a heavy price for all of the things she discovers. The book’s ending should satisfy any reader prepared to buckle in for a wild and bumpy ride through the myriad of misconceptions of early motherhood.